If you train hard your joints are exposed to extremely high overload. Torque is the product of the load and the length of the arm and that means that your bones in place bend carry many times more than you see on the bar, which is why you hear so often overload the pond and the process of returning to the form it takes, even weeks. 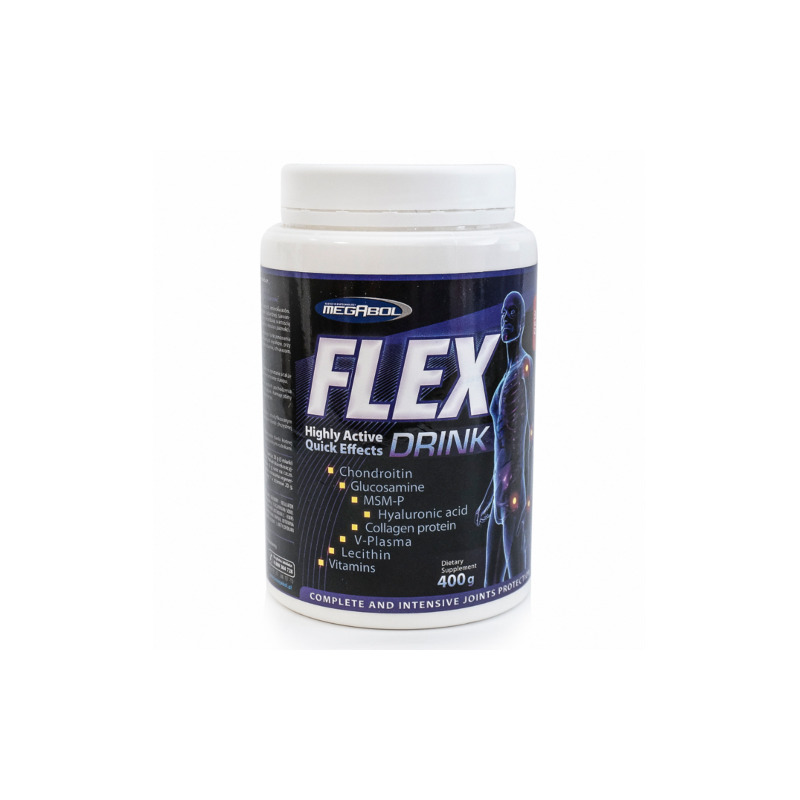 The preparation FLEX DRINK your joints will be safer, complex compounds brought to give them what they need. But even the best supplement on the market - FLEX DRINK Megabol nourishes, but not replaces imagination, remember the competition and progression. Protein collagen (gelatin hydrolyzate) is a natural source of peptides and amino acids themselves, which are used in the production of collagen. The product FLEX DRINK Megabol used the most advanced, enzymatically hydrolyzed material ZERO BLOOM, characterized by record high biological value and assimilation. Collagen protein has a positive effect on the condition of the joints, hair and nails. 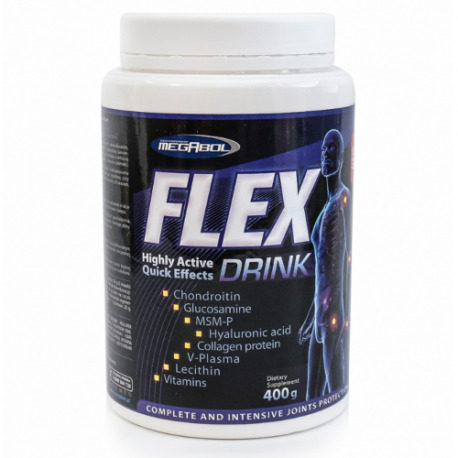 Glucosamine is an amino acid whose presence is necessary for the proper functioning of the joints. The natural amount of glucosamine in the body is reduced in the event of intensive efforts for obesity and also with age. Providing glucosamine prevents the degeneration of joints, their injuries, stimulates the production of synovial fluid and reduces striae. Chondroitin sulfate protects and regenerates cartilage tissue. Hyaluronic acid is an important component of connective tissue, its absence reduces the resistance to crushing of joints and causes wrinkles. The presence of hyaluronic acid results in a natural joint lubrication. MSM-P (Matrix Molecules of Plant Sterol) is an innovative component based on sterolach natural (plant). MSM-P stimulates the processes of chondrogenesis, cartilage regeneration and inhibits inflammation. It is a modern replacement ingredient methylsulfonylmethane withdrawn from the market. Lecithin is a synovial fluid components, improves elasticity and structure of membranes. V-plasma (plasma hydrolyzed globulin) is an innovative, technologically modified plasma hydrolyzate, which specific proteins are the substrate for the synthesis of cartilage proteins and stimulates its renewal. Vitamins - Vitamin suitably arranged supply support processes in bone tissue supplied components (including calcium and magnesium) and prevent degradation processes induced by free radicals. 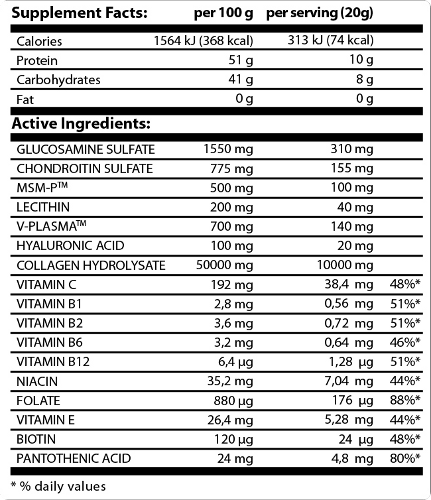 Mix 1 serving: 20 g (3 scoops) in 250 ml of water. Recreational Prevention: 1 x 10 g per day, in the morning on an empty stomach. Heavy loads and displays tissue regeneration: 1 x 20 g per day, in the morning on an empty stomach.